Welcome to Paragliding Forum - India! Paragliding Forum - India is a web based forum. 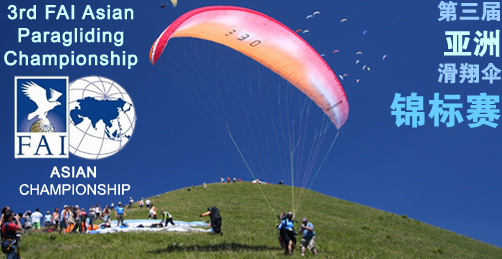 It is an initiative to bring the fast growing Indian paragliding community together. Membership to this forum is open to all PG pilots, students, schools / clubs and adventure enthusiasts from around the globe. Though 'Indian Paragliding' will be the main focus of this forum, you are welcome to discuss paragliding in other parts of the world. 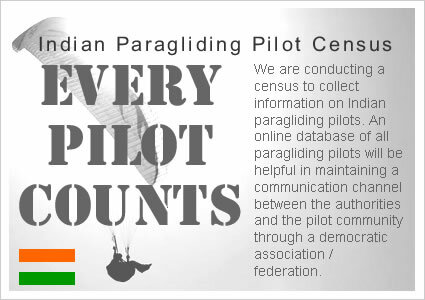 Disclaimer : Paragliding Forum - India is not an association / federation / club / society or institution in any form. Paragliding Association of India (PAI) and Goa Airsports Association hosted the Fun-Flying Beach Festival - Goa 2012. The festival was held at Anjuna Beach from 27-29 April 2012. 'SIV Guru' Jocky Sanderson conducted a 3 day PAI Safety and Thermalling workshop. The workshop covered Safety and Thermalling course, video sessions and a lot more. 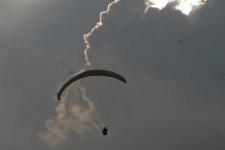 The First PAI Paragliding Festival concluded at Kamshet, Mahrashtra. The event was a grand success with 60 participants from various parts of India taking part in this 3 day free-flying festival and Spot Landing Competition. 3rd year of Yelagir festival attracted many pilots from all over the country and other parts of the world. A team of 7 pilots from USA, France, India, Austria and Spain are crossing the Himalayas in a bivouac expedition. Pavagadh paragliding festival will kick off at the pilgrim hill station of Pavagadh near Vadodara, Gujarat. The four-day festival has been organised by ex-army man and sports enthusiast Captain Rajiv with the aim to not only survey the potential of the sport there, but to also explore whether Pavagadh can make it on paragliding map. Himalayan Paragliding Open 2009 - Pre World Cup / Indian Nationals 2009 is scheduled for 4 – 9 November 2009 at Bir-Billing, Himachal Pradesh. Organized by YASA and YPC. Yelagiri is situated a few km East of Jolarpettai Junction, 20 km north east of Tiruppatur and 80 km south west of Vellore. PG Gurukul conducted SIV course in collaboration with Army Adventure Wing in Phangotha, Punjab. Mathieu Rouanet demonstrated a mind blowing flying roadshow for a stopover of the Volvo Ocean Race and the Kerala Tourist Board. Paragliding pre-world cup [FAI Category 2] organized by INDIAN pilots and sponsored by Himachal Tourism. This forum can be viewed by all. In order to participate in a discussion or post a topic you need to register. Debu Choudhury for finishing No. 3 at British Paragliding Championship at St. Jean de Montclar, France. Debu scored 1761 points and grabbed 3rd position against 133 competitors. Gurpreet Dhindsa for finishing No. 10 at SkyNomad Open 2011 at Sopot, Bulgaria. Debu Choudhury for finishing No. 16 at Paragliding World Cup 2011 at Bayramören, Turkey. Debu scored 4061 points and grabbed 16th position against 124 competitors. Debu Choudhury for finishing No. 15 at British Paragliding Open Championship 2010 at Kobarid, Slovenia. Debu scored 4789 points and grabbed 15th position against 138 competitors. Gurpreet Dhindsa bagsNo. 3 position at '2009 CIS Open' at Kazakhstan. Gurpreet Dhindsa wins No. 1 position at 'Kazakhstan Open Championship'. Gurpreet Dhindsa earned No.2 position (overall) at Turkish Pre-PWC Bayramören & 2009 Turkish National Championship. Dilip Kotecha came 1st in serial class, 7th overall at At PWC Serbia.